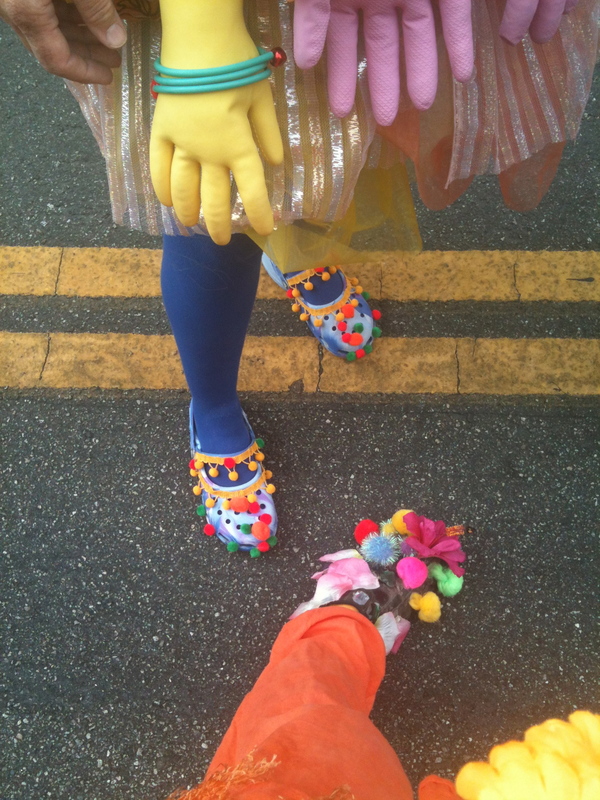 Kickstarter project FUNDED and Summer Solstice Parade is over. Dear friends, art lovers, blog watchers, thank you for being patient with me. The last days of June have been ever so busy, as I was immersed in Summer Solstice Parade in Santa Barbara as an Artist in Residence. BUT before I go into that episode I want to say how grateful I am for all who contributed to the Tile House on kickstarter. As you probably already know the Tile House reached and exceeded it’s goal of raising $7000 for tile, scaffold and helpers. Everyone who contributed made an impact. I will be resuming work on the Tile House in August, as well as getting people their rewards for donating to the project. Thank you all !!! 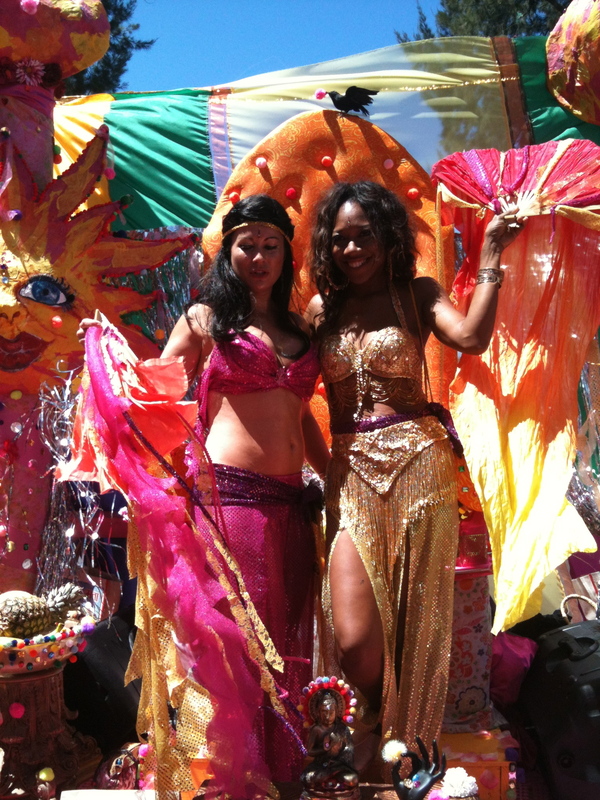 Summer Solstice Workshop and Parade kept me glued to the helm of the Epic Hindu Bhakti Shakti ensemble. With deities, Ganesh, 3 Krishnas, Durga, Kali, Lakshmi and Buddha to gather and creating a throne for Ganesh with life-size altar, I was in the thick of it when kickstarter ended. Paper maché a moon, a sun, 4 turrets and a lion with my 3 neices and nephew who landed at the right time, magically like everyone else… came to assist in bringing the vision to light. Jai Ganesha !!! With M.C. Yogi’s fabulous, Ganesh is Fresh on the super speaker system, we took off, down State Street, to the cheers of the crowd, 100,000 strong… Push, push, push THAT float!!! Somehow, I was destined to push my creation up the street with my husband and 4 other volunteer helpers, with 700 pounds on board… oy vey !!! 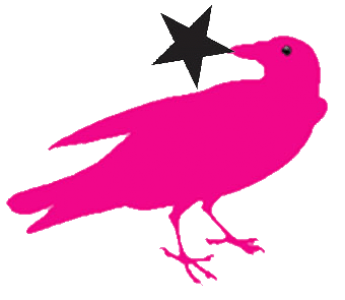 I survived and did not have a heart attack, SUNNY day in Santa Barbara and all up hill… I did end up with a couple of doctor visits the week after… whew!!! I’m ok… good actually! Feeling blessed and grateful for every part of it. 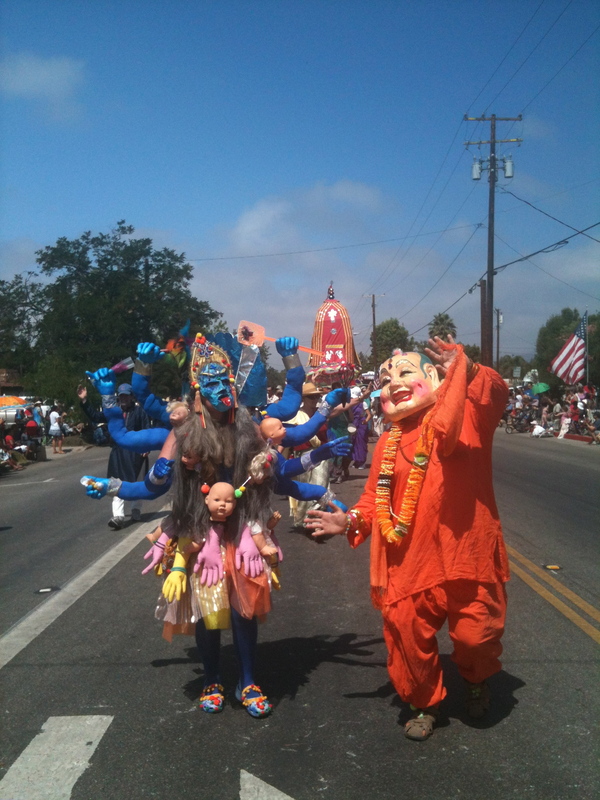 During the Parade we were invited to join the American Vedic Assoc. 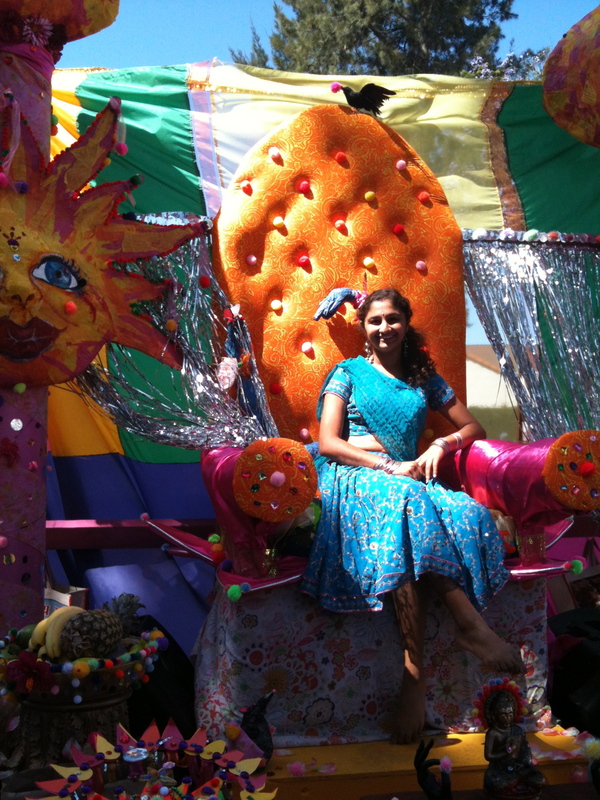 Jagannatha float/chariot in Ojai for the Independence Day Parade. An intersting mix of farmers, sheriffs, search and rescue, Jesus and Krishna…Kali, Ganesh and Buddha made their appearance and joined the Jagannatha parade and danced one mile down the street with not a worry in mind. A pure joy to be so appreciated by the audience and the group as well!! Hari Bol!!! So, yes folks, I am just catching up, preparing to bring you more imagery for your hungry little eyes!!!!! Buddhas and tiles getting ready to be created, August mosaic workshop on the eleventh in Santa Barbara and then off to the Tile House to resume some major work!!! Thank you thank you everyone!!! Some pictures from Santa Barbara and Ojai… enjoy Hari Bol !!! Could not have accomplished what I did without the support and artistic talents from my neice, Hannah Smith, artist extraordinaire who assisted me for 2 weeks!!! Thank you Hannah!! !